The Amherst Record in 1881 published a report about the first annual meeting of the League of American Wheelmen which occurred in Boston. The article states “over 5000 people gathered in the vicinity of Commonwealth Avenue to witness the 800 wheelmen on bicycles in line. This was an important meeting, as the bicycle is constantly growing in importance in America. The League was given a banquet at Music Hall at 5 o’clock p.m. which was followed by speeches and the reading of letters from Gov. Long and others who could not attend the meeting, music, etc. Col. Albert A. Pope of the Massachusetts Club, the pioneer manufacturer of bicycles in the United States, and a widely-known and popular rider, detailed in a pleasing and interesting manner, the development and progress of bicycling in this country. He observed that it is only 14 years since the bicycle was first introduced into England, and yet there are upward of 200,000 riders in Great Britain.” The bicycle offered Amherst a lively new way of locomotion and many learned to ride. The Nonotuck Cycle Club held races in Amherst’s Hampshire Park. There were road races and excursions. Athletic pursuits had become a normal part of student life at the colleges by this time and cycling fit well into the goals of competition and physical fitness. Century runs, 100 mile bicycle stints, were popular in England and were catching on here as well. The first century run officially recorded in the U.S. was completed in December of 1880 from Louisville to Frankfort, Kentucky for a distance of 104 miles in about 16 hours. 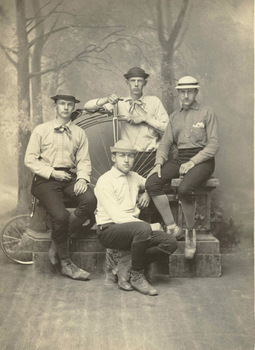 The second and third long-distance rides reported were accomplished by two students of Amherst College, on the road between Amherst and Boston, during the first week of the summer of 1881. In the first place the captain of the College Bicycle Club, Paul Blatchford, '82, of Chicago, on returning from the League's second annual meet, wheeled from Boston to Amherst, 102 miles, in 15 hours, ending at 8.30 p. m.
"In a half-hour, with a groan, I reluctantly mount, for the hardest 23 miles of the day. Every muscle protests vigorously, but I know that this is one of the longest road-rides in the country, and I rejoice to sacrifice my muscles for the honor of the club which is so far ahead of the other colleges in long-distance riding, I dismounted but once during the 23 miles, and reached the hotel in Framingham at 8.30 o'clock. This was the fastest spin of the day, and during the last 10 miles it seemed as if I had outridden and left behind my muscles ; for a sort of numbness set in, and the riding was merely mechanical. I stayed in bed only from 11 till 3.30 o'clock, and at 4 a. m. resumed the ride homeward. My muscles were, if possible, stiffer and lamer than the night before, but began to limber up a little at Northboro', where I breakfasted. Worcester was reached at 8.30; Ware at 2 p. m.; the only header of the two days rewarded some reckless down-hill riding near Belchertown; thence a driving rain accompanied me to Amherst at 6 p. m., 80 miles. The next day I experienced no ill effects, and was in better trim for further riding than when I started, though I had covered 205 miles within 38 hours." Amherst Record, June 1, 1881. 2. Hazlett, C. A. "Notable Runs and Excursions of 1883." Outing 3 (1884): 367. Available on GoogleBooks. Hotchkiss-Bagg, Lyman. Ten Thousand Miles on a Bicycle. New York: Karl Kron, 1887, 1887. 113. Available on GoogleBooks.